From Maine to San Diego. Ken Griffey’s grotesquely swollen jaw. Steve Sax and his run-in with the law. 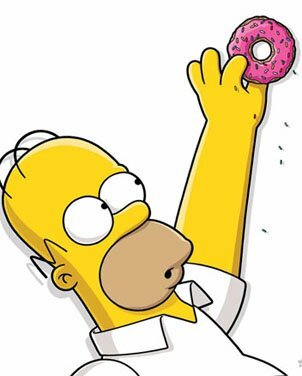 We’re talkin’ Homer… Ozzie and the Straw. Update: It appears we have our first bug of the new content. Part 1 of the questline is supposed to give you Aristotle (full character) if you don’t already have him, however, it’s not. And you need Aristotle to complete part 1 of the questline (can’t send Burns without him as it’s a joint task). So quite a few players are stuck right away on part 1. No workaround at the moment, have to wait for it to be patched. You can try to contact EA and see if Customer Support can add him to your inventory, otherwise, we just have to be patient. 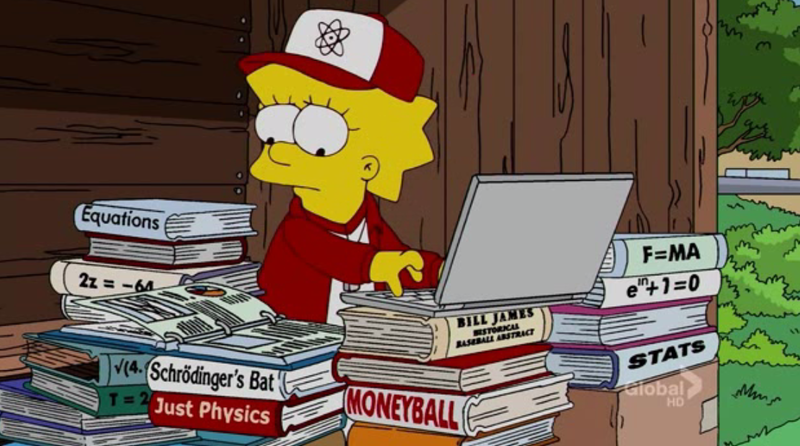 So it’s 10am here on the East Coast of the US and that means Marge at the Bat is now live in our games. As I mentioned a few times, it appears there is no new content with this one. It’s an 8 part questline (that will take approx 32hrs to complete) and a bunch of returning content (some for Free, some for donuts). You’ll have two weeks to complete the questline and purchase items you’re eyeing, as this content is slated to leave our games on April 24th. 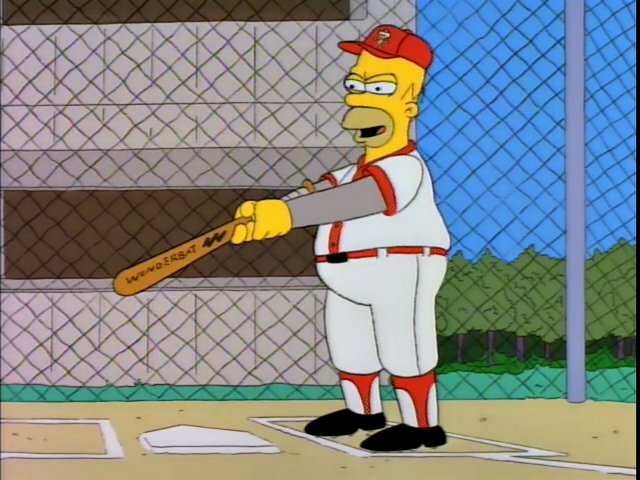 So as I wrote about yesterday, an update hit the files titled “Marge at the Bat”. Upon first glance, this looked like a pretty standard mini-event. Two weeks of content, and not much else. However, as I’ve dug deeper into this I’m not quite sure what to make of it…. As we sit here frakkin files, pulling pics, and typing a million words a minute to get our readers the latest updates and information…we sometimes find ourselves forgetting to stop and enjoy our own games. More so our neighboreenos. So we try to make it a point to hop in n out of the towns now and then to see what cool things YOU are up to. So we have decided we want to continue to focus more attention (as if we don’t already 😛 ) on YOU…our readers. 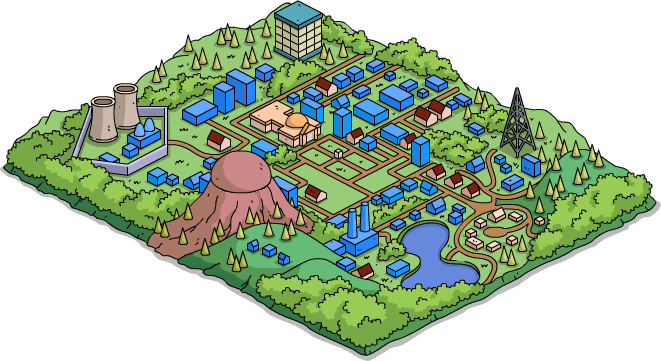 Time to time we will be peaking into your towns, checking our Flickr, and also the posts in the comments below to see what cool ideas and designs YOU have come up with to make your towns unique and…well…YOU. So here is YOUR chance to show off all your hard work, time, donuts & in-game cash spent. Send us your work, no matter how big or small and brag about it to the world. We want you to! 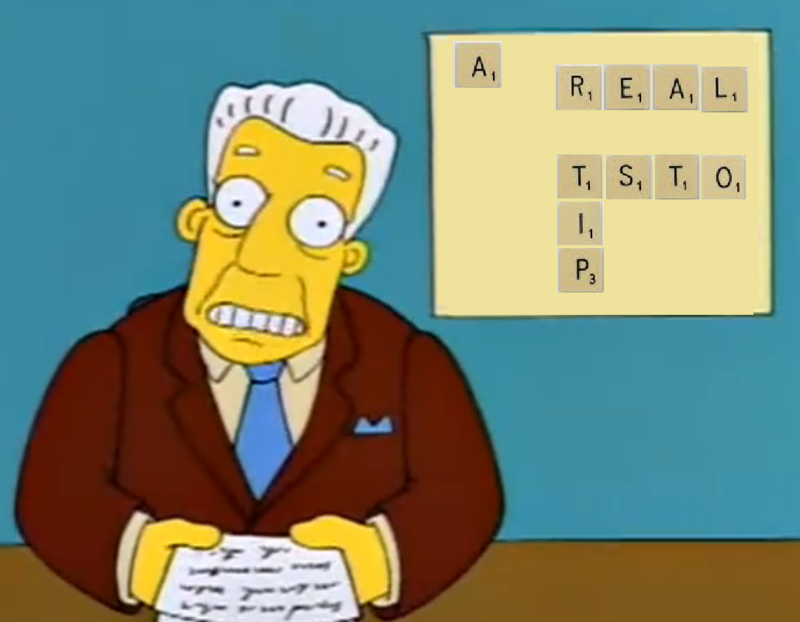 Then keep your eyes posted to Addicts to see if YOU end up on our “SPRINGFIELD SHOWOFF”. Back to back mini-events in Springfield! At least we have new content, right? I think they only thing we can be sure of these days from EA is to expect the unexpected. I don’t think any of us thought another 2-week mini-event would follow State of Despair, but here we are. 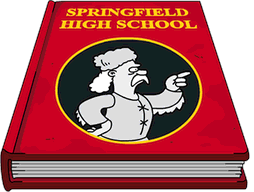 It’s reunion time for Marge, Homer, and the rest of the Springfield High Gang. What will happen? Will Homer get his ham? You’ll have to read the dialogue to find out. Wowsers the latest mini-event to hit Springfield brought us the ultimate Mystery Box! With over 700 items (737 at my count), the Yearbook Mystery Box is the largest single Mystery Box to ever hit our pocket-sized towns. This isn’t your ordinary Mystery Box. No, this is a premium box full of almost every limited-time (and not so limited-time) premium item and prize to ever hit Springfield. It’s pretty insane. Back to back mini-events in Springfield! At least we have new content, right? I think they only thing we can be sure of these days from EA is to expect the unexpected. I don’t think any of us thought another 2-week mini-event would follow State of Despair, but here we are. In looking at the content for this one, while yes this mini-event has the standard 5 prize questline, it’s mostly about the returning content. This mini-event comes with the largest mystery box I’ve ever seen. What feels like every single item from Springfield is back in one Mystery Box. Literally, hundreds and hundreds of items are in this one box. Over 700 items available. All for 30 donuts. That’s what this event is about. Reunions. 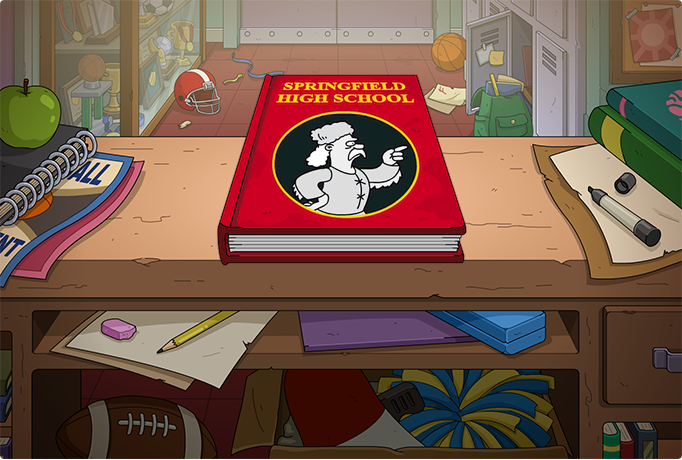 Both of the High School variety and returning content to Springfield variety. And before I hear from the “This game is ending crowd”…get a grip. Please. This is basically Black Friday, but 1 Mystery Box instead of 15-20. As always with brand new content, I’m still going through everything. So continue to check back on this post as I’ll be adding to it as I go. Once it’s finished I’ll add “Updated and Complete” to the title. There is an update on the server side of the game right now. I’ve got to go through the files and see what’s incoming. Initial examination tells me that this will be called Classless Reunion, and it will be another mini-event. 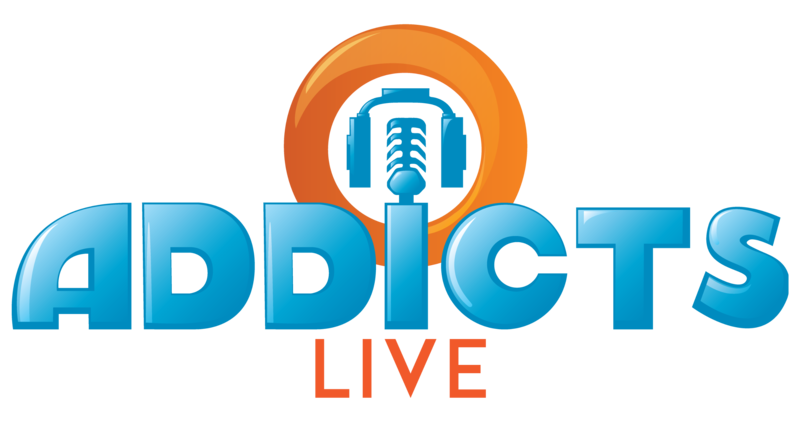 This will start Wednesday (tomorrow) March 13th (1400 UTC, 10a ET) and ends Tuesday, March 26th. Pulling details and info, but I really won’t have content up here until it goes live in our games. So for now just know that it starts tomorrow, and because it’s a mini-event you shouldn’t have to download anything from the App Stores. 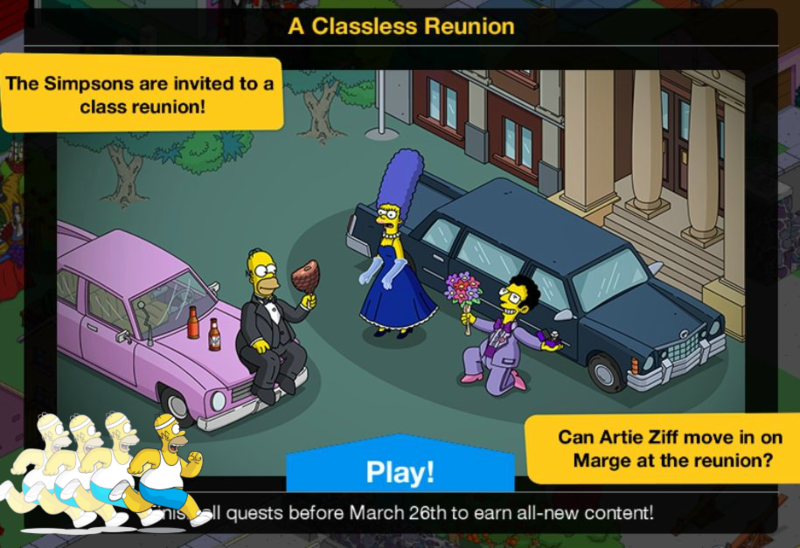 Tagged Tapped Out Tips and Tricks, The Simpsons Tapped Out, TSTO Addicts, tsto classless reunion, TSTO new event, TSTO Tips and Tricks, TSTO Update, Whats next in TSTO?, When Will the next update hit TSTO?